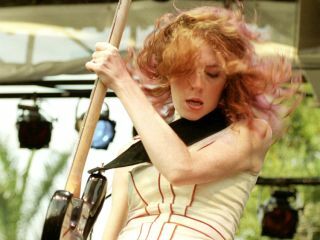 Most people know bassist Melissa Auf der Maur from her stints in the bands Hole and Smashing Pumpkins. But that's likely to change with the release of OOOM (Out Of Our Minds), her ambitious second solo CD due out 23 March. "I see this project as a way of utilizing all of my talents and interests," says Auf der Maur. And she isn't kidding: OOOM is a multi-media experience, encompassing a CD, comic book and a 28-minute film directed by Tony Stone, the storyline of which is best described by Auf der Maur herself (see the interview and listen to the podcast below). Auf der Maur, who financed the project herself after being dropped by Capitol Records in 2004 ("the best thing that could have happened to me," she says, "because creative survival took over"), sees OOOM as a natural extension of her creativity. "From grades 1 through high school I studied music, visual arts, performance arts, everything. So I never thought I had to choose one or the other." What's the basic storyline of the comic book behind OOOM? "The comic book reflects the film and the film reflects the song, so it really comes down to 'What is Out Of Our Minds, the song, about?' Out Of Our Minds is the heart of this record. It's a cry to travel out of our minds into our hearts, standing by. "It's about a need to go from the masculine, intelligent, intellectual side to the emotional, feminine side of everything. It's the feminine force in all of us that is on the hunt to connect with the heart of the matter in the center of all things emotion. "Quite literally, it's a woman who is trying to unite her heart side with the rest of the world. The story of the film, which the comic book reflects, is about a timeless female character who gets into a collision and travels through time, and through that comes in contact with a Viking's heart and the center of a bleeding tree and back again. It's time travel and blood; it's the female connecting with the heart of everything." Well, that is quite a story! Now, on the album, you have some pretty cool collaborators, people like Alan Moulder and Mike Frazer - what did they bring to the project? "Those guys are the magic mixers. But to explain the making of the album, it was one woman and a hard drive, going from many different collaborators and studios. I worked with a couple of different producers, an old Canadian collaborator, Jordan Zadorozny, and Chris Goss from California, who I made my first record with. "The actual making of the songs was over the course of many years and many different trips to different places and different friends. Those guys that you mentioned, the mixers, were some of the most crucial elements to tie this all in to itself. In many ways, it was like 12 different films that needed to live within one roof." Is writing a fairly easy process for you, or is it a struggle? "It comes very easily when I'm in creation mode. I don't write when I'm not in creation mode. I mean, I always keep notes of inspiration and diary entries. But when I sit down to write a record, I sit down to write a record for a year." What do you demo on? "On an old four-track Tascam cassette recorder." Wow! Old-school. Do you play other instruments on your demos? "With this record, I found my voice. Hopefully, people will hear that I've worked really hard and that I have something to say." "I play guitar. I write most of my songs on guitar, but it's very simple, minimal. When I write on my four-track, it's a drum machine, guitar and some keyboards too. "A couple of my songs I wrote with a drummer. Out Of Our Minds came from a really great jam with a drummer named Vince Nudo from a Canadian band called Priestess. It was a revelation to actually write with a drummer and not a drum machine. As a bass player, it is a sad state of affairs to play with some old, crappy drum machine." Your voice sounds remarkable on the new album. Do you think you're going to surprise people who know you only as a bass player or side person in other people's bands? "I don't know. Hopefully! [laughs] I will tell you one thing: I did make a solo record that 200,000 people on the planet bought, and lots of people heard that didn't buy it. So I know there's some people out there who know that I sing. That being said, I had not found my voice yet. With this record, I found my voice. "I wrote that first record before I ever played a live show as a front person, and when I went on tour and played 200 shows, every day was a learning experience. Hopefully, people will hear that I've worked really hard and that I have something to say - which is, I want to share my heart with people." The album's title track has some great guitar work. There's a very cool riff and terrific atmospheric sounds. Who did the guitar playing on it? "My main collaborator on the record, Jordan Zadorozny. That was made during the Canadian chapter of the record, very early on in the process when I was still on Capitol. Jordan was in my first band before I joined Hole. It started as a demo. He's a longtime collaborator and a phenomenal guitar player." "That's the same crew, the exact session that Out Of Our Minds came out of. It's the same drummer, Vince Nudo, the same guitarist, Jordan Zadorozny, and me." "Yeah. I really wanted this record to be a journey, not always action-packed with a woman trying to tell her story. There's a couple of instrumentals on the record. I really wanted to open it up so that when the voice and the story come back they make more of an impact." Talk to me about working with Glenn Danzig on Father's Grave. How did that come about? "It was very intense. My years in Hole were almost as much emotional life lessons as they were musical." "I don't even have enough hours in the day to tell you what a dream come true that entire collaboration was. I wanted to do a duet with Glenn Danzig since I first heard him when I was 17. I prayed and wrote letters and sent them to a P.O. box, and I told him about my feelings for him and what kind of a role model he's been as a persona and a person. And I'm speaking to you from New Jersey! Switching gears, let's go back to some of your previous bands. You originally turned down the invitation to join Hole. Why was that? "Because I was in my own band and I was finishing my photo degree. And I had also seen Hole and I knew that it was an invitation to replace a tragically deceased individual [original bassist Kristen Pfatt, who died in 1994]. In the end, I took it as my fate that they asked me and wanted me. It was very emotionally complex, but I ended up rising to the occasion and taking the position with honor. "But it was very intense. My years in Hole were almost as much emotional life lessons as they were musical. I was very dominated by a lot of intense experiences." Courtney Love is such a polarizing figure. Some people love her, some people don't. Do you feel she gets a bad rap? "Yeah. The world loves demonizing women. They're so terrified of a strong, outspoken woman. Still. Even in the 21st Century, but more so 100 years ago, 50 years ago. "She represents things that everybody is afraid of: the madwoman. Do I think the scary parts about her are over focused on instead of her talent to offer her demons, her heart and her guts? Every single performance she's ever given, she's given all of that. Ideally, that's what people should be focusing on and not the tabloid stuff, but I understand why they're distracted." As a musician, what was Courtney like to work with? "Like I said, sometimes it was a lot more to with personal relations than with music. I mean, we made one record in five years, so there was a lot of stuff going on. But my work on Celebrity Skin, I'm incredibly proud of it. We worked on it for years and I think it's a very well-achieved piece of music. I'm very proud of my musical contribution to that band." You also played with The Smashing Pumpkins for a brief period of time. "Yeah, talk about craft. That was my ultimate music lesson. Playing with James, Jimmy and Billy was probably the biggest musical experience for growing and learning that I'll ever have. Learning their catalogue, touring for a year and playing two to five hours a night…probably the most valuable years I'll ever have in my life. I wouldn't have been able to make this record had I not done that."